1. Shopping Together: Before you visit the grocery store, try checking your shopping list first through http://www.WeBuyBlack.com . As the world’s largest Black owned online shopping platform, they offer the best opportunity to buy, sell, & showcase Our products to Our global community! 2. Boycotting Together: Boycott from buying products from companies who support and finance legislation that negatively impact Our lives and livelihoods. Although we may differ on who deserves to be boycotted more than others, the corporations who support ALEC (whose responsible for Stand Your Ground, Voter IDs, and other “school to prison pipeline” tactics) have a direct conned on to our plight and should never see our money. Just as they advocate: no more free rides. Use the http://www.Buycott.com app and select an “ALEC” campaign to boycott purchases by who they fund to ensure not a drop of Our money will finance those directly against Our well being! 3. Saving Together: Sometimes the best thing you can do w/ your money now is save it for a we better use later. And while you put away Credit unions are one of the earliest and most successful forms of cooperative economics. Find a Black owned credit union near you, or form one of your own (www.AACUC.org), to take advantage of acquiring rates and adding leverage to your financial opportunities! 4. 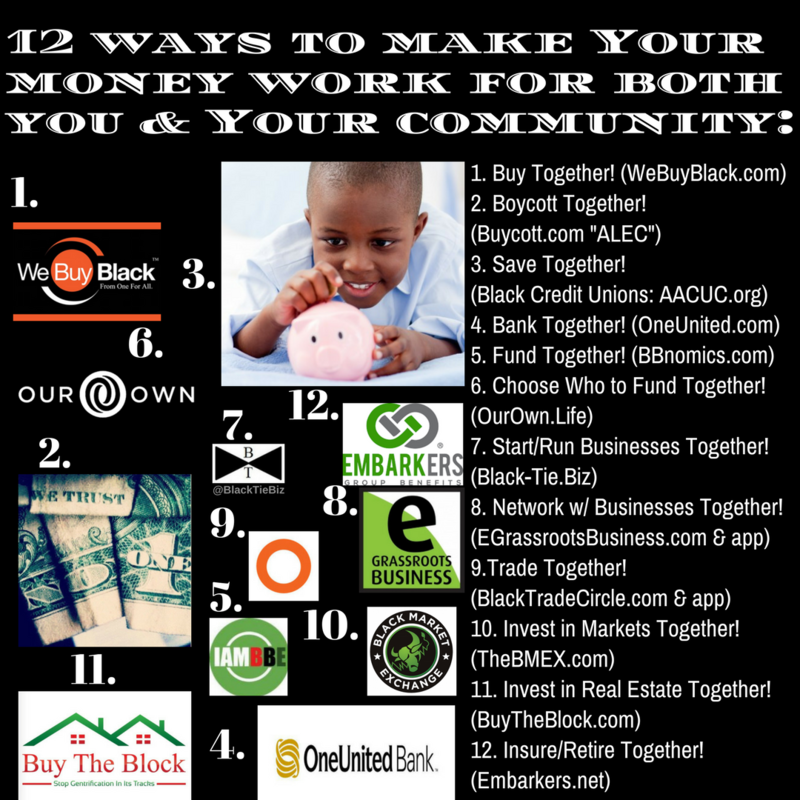 Banking Together: Find one of the 38 Black-owned/operated banks left for your financial needs. http://www.OneUnited.com is the Largest Black Owned Bank in America and offers Online & Business Banking at a competitive level as other popular banks. And the more we put our assets together here, the more banks like One United can become a more self-capable commercial player in developing our financial industry. Set up an online business account today! 5. Fund Together: We can never truly build w/ full autonomy until we depend on ourselves for affording it. But when we need to crowdfund for causes or businesses, we need to stop thinking “gofundme” and start thinking http://www.BBnomics.com ; Our largest crowdfunding platform in America! Start or support a campaign today! 6. Choose Who To Fund Together: Worried about if the right businesses get funded? http://www.OurOwn.Life provides a crowdfunding platform that we can fund, get informed & even vote together on the best projects in your own community! You can join their mission to build & diversify Our dollar starting as low as $1! 7. Start/Run Our Businesses Together: Seeking to start (or grow) a business? Don’t “LegalZoom” it. Just “Black-Tie” it! Black-Tie offers a plethora of start-up services for under $100, free consultations, & also subcontracts work to other Black-owned businesses & professionals; creating a full-service environment for business development. They’ll also pay you $50+ for each referred friends and family use them to start a business. Visit http://www.Black-Tie.Biz to book a free consultation on how to best afford and develop your ideas, dreams, causes, & passion projects grow into real businesses! 8. Network w/ Businesses Together: When it comes to business, it’s not only who you know but who knows you! There’s nothing like getting Enter E-GrassRoots Business: the largest online Black business network & directory . Download their app at http://www.EGrassRootsBusiness.com , & join their FaceBook group “Black Owned Businesses” to network, engage, & grow w/ over 43,000 verified Black owned businesses & service professionals real-time! 9. Trade Together: Buy, Sell, Converse, Lend, Socialize, Act, etc……Black Trade Circle offers boundless ways to connect and empower each other in this Information Age! Their innovative approach focuses on the core elements of Our social consciousness, entertainment, culture, community & economics to make the Global Village work similar to Our villages in past histories; how civilizations were born since the beginning! Download the app at http://www.BlackTradeCircle.com . 10. Invest in Markets Together: While many financial service platforms offer credit repair, budget tactics, and savings plans (as they should); they don’t really dive into the invest world. There’s more to investing than mutual funds and index funds. And, the Black Market Exchange ( http://www.TheBMEX.com )are the #1 urban investment education site for millennials and aspiring investors that have been under-served & under represented for generations. Plus, their unorthodox approach of blending Hip-Hop and investing in the financial arena will have you learning & running your investment portfolio. Join their 30 day challenge today! 11. Invest in Real Estate Together: We can either continue to let others gentrify us out of our neighborhoods; or Buy the block back! http://www.BuyTheBlock.com enables Our communities to buy & profit from real estate together as “BlockVestor”, starting as low as $25! And as Block Developers, Buy The Block helps us acquire financing and develop Our own communities; a new mechanism to raise capital via the internet through our real estate crowdinvesting platform w/ massive databases of BlockVestors.